Santorini, Greece is an ancient, volcanic island known for its beautiful white sand beaches and crystal clear water – in a word, paradise. Like any good vacation destination, visitors can openly sip on a glass of white wine while basking in the golden sun. What many do not know is that the delicious wine you will find in your glass is actually crafted with the care of thousands of years of tradition on the island itself. Driving through the island, many mistake the bushy plants scattered on various plots as weeds, but in reality these bushes, known as “koulara,” are the grape vines responsible for the production of the indigenous white grapes Assyrtiko, Athiri and Aidani. Not only are the island vines unique, but its land is too. Santorini volcanic soil does not contain any clay, making Santorini vines immune to phylloxera, the parasite that devastated much of the world vines in the early 1900s. The combination of Santorini immunity to phylloxera and the island unique style of vine growing have allowed Santorini to hold some of the oldest thriving vines in the world. The “kourloura,” better known to English speakers as a “basket vine,” is grown in a basket shape; the vine is woven as it grows. Typically, a vine will provide suitable nutrients to its grapes until around 75 years of age. At this time, the wine grower clips the vines at its roots and grafts a new vine to the ancient rootstock. Vines are typically three years old before its grapes will be used in the production of any wine. The island is known for a high heat index, brisk winds and very little rain. The koulara vines help offset these harsh conditions, as the grapes are grown inside the basket to protect them from the elements. The koulara roots grow deep into the pumice soil, searching for the moisture absorbed through the winter rainfall and misty mornings. The salt water mist attributes to the known salinity of the wines while the soil is responsible for the mineral quality. 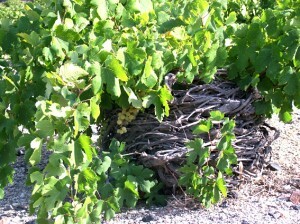 To date, Santorini is the only place in the world known to grow grape vines in this manner. Throughout the growing season, grape growers interfere very little with the vines; there is no irrigation or reason to disturb the vines until the harvest in mid-to-late August. Many times the winemakers are unsure which grape is grown where at any given time, and will only work to separate the grape types at harvest. Talk about little intervention! Even with these established traditions, Santorini has only ten major wineries that are located throughout the island, the largest of which is the island cooperative, Santowines, which sources grapes from various growers across the island. With such a small-yet-emerging industry, most wineries would be considered boutique due to their small production. One can be assured that every wine from the island is crafted with extreme care. Not only are the island pristine beaches and waters remarkable. The wines, traditions and vineyards are equally gorgeous.